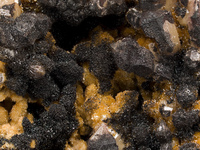 How often can one use the word 'castellated' to describe a mineral? 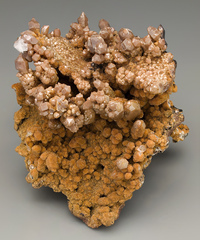 This Disneyesque specimen consists of a framework of vanadinite turrets partially coated with furry tigger-orange descloizite. There is also some plattnerite on the back side. 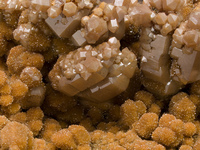 Originally it had a cap of calcite, which I removed with vinegar. 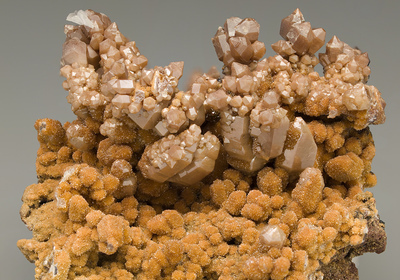 The exposed vanadinite tips were extremely fragile and unfortunately were a bit damaged as I handled the specimen. 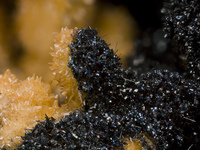 Both the vanadinite and the descloizite contain some As, by SEM/EDS, but not enough to warrant altering the species name.